The work of covering of Palam Drain was awarded on 12.10.2002 to M/s. Ansal Properties and Industries Ltd. Initially, the work could not be started because of earthquake in Gujarat from where the agency had to procure T&P such as Batching mix plant etc. The work was geared up after the monsoon season of 2001. The progress of work as on 31/8/07 is 95%. The program has been chalked out for the execution of work keeping in mind the restrictions imposed by I&F Department during the rainy season i.e. from June to September every year. 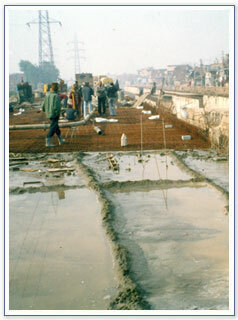 During this period the entire portion under execution is submerged and the work virtually become stand still due to flow of water in Palam Drain. The I&F Department has also directed that there should not be any obstruction in Palam Drain during the rainy season to avoid any heading and over flowing of water in upstream portion where several residential localities exist. Both the Carriage Way are completed and open to traffic for test drive. Miscellaneous works of Service Road, Footpath and Coating over the walls are in progress. The work is likely to be completed in all respect by 31.12.07. Six lane road over covered drain with service roads. Five Nos RCC Boxes of 4.0 Mtr width each. Precast walls in straight reach with cast in situ raft & top slab. Silicon sealant joint to be filled by injecting method. Ramps at every 200 Mtr, Cleaning of drain to be done mechanically. Special treatment on inner sides of covered drain to prevent erosion of concrete. i) Polymer base sealing layer. ii) Side wall of cleaning ramps. 4 mm thick poly carbonate sheet at central verge and at roof of ramp.